A Jordanian-Canadian with Palestinian roots, Harb moved to Canada to commence university studies. 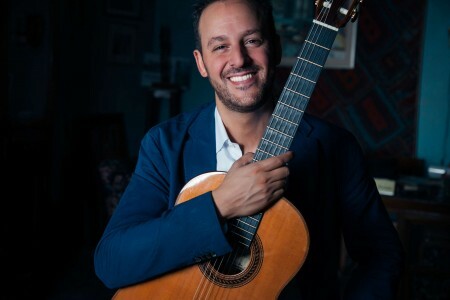 At age 25, after quitting his initial career in finance and starting a performance career in music, he diligently studied the guitar with Roddy Ellias, Patrick Kearney, Jerome Ducharme, Dr. Garry Antonio and Dr. Jeffrey McFadden, and the violin with Clemens Merkel of the Bozzini Quartet and Claude Gelineau. He also participated in numerous masterclasses, including ones run by Jason Vieaux, Pavel Steidl, Rémi Boucher, and Manuel Barrueco. Harb currently holds a Doctor of Musical Arts degree from the University of Toronto, a Masters in Performance degree from McGill University, and Bachelor of Arts and Bachelor of Commerce degrees from Concordia University. He joined Concordia University’s Music Department as a faculty member in Fall 2015. Tariq Harb is sponsored by Hill Guitar Company, Savarez, and LaBella Strings.